I have been using Windows 8 full time now for just over a month, a fairly short period (I did have a VM running for a couple of months to check it out as well, though to be honest did not have much time to play with it). I did not think I would be a fan, I tended to heavily customize and favour my start menu structure, but I can honestly say I don’t miss the start menu; hitting the start button and just typing one or two letters of what I want is so smooth and fast that I am kinda glad to be rid of my OCD organization of my start menu into organized sub folders and groupings. The start screen is also growing on me, quite like the live tiles, even though I spend almost all my time in desktop mode and I have no touch screen, I still use it. It is easy to use and a nice change from small static icons. Most significantly, as a rather heavy user of VMs and high memory development software, plus 30-50 windows open at any one time across 3 to 5 screens; is that the whole OS is lot faster and slicker, even with two or three VMs running in the background, all on a laptop, not a high spec desktop. 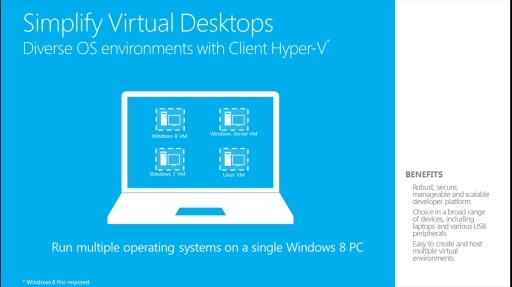 Hyper-V On Windows 8 – Why? Admittedly there are several hoops to jump through to get VB6 to install correctly, and our antivirus solution (McAfee 8.7i) took a bit of work to install (see https://developtheweb.wordpress.com/2013/02/13/trying-to-install-mcafee-8-7i-onto-a-windows-8-box/), but got them both working and do not have any apps I currently use that I have not been able to install (for Windows 7 SDK on Windows 8 box see https://developtheweb.wordpress.com/2013/03/04/windows-sdk-for-windows-7-and-net-framework-4-on-a-windows-8-pro-dev-box/ – same issue affects latest SP of Windows 7 as well). All in all I’d happily recommend Windows 8 to anyone, whether for business, development or personal use. Update: Forgot to mention another neat one… I use a lot of ISO disk images, Windows 8 supports them out of the box, no need for 3rd party tools and drivers, just right click and Mount; and you can mount many at once! Alternatively, from the same guy, for the tech savvy or those folks short of time – same content in just 4 minutes. 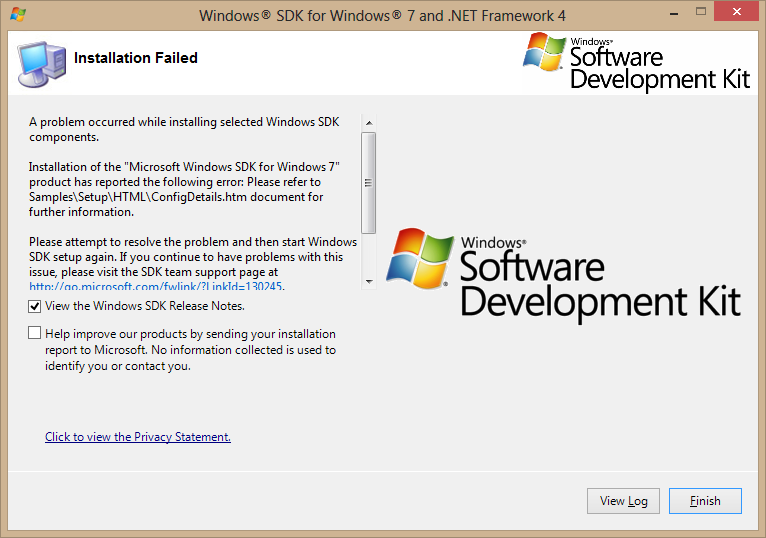 Ran into an issue today trying to install “Windows SDK for Windows 7 and .NET Framework 4” (http://www.microsoft.com/en-gb/download/details.aspx?id=8279) on my Windows 8 Pro Dev Box. 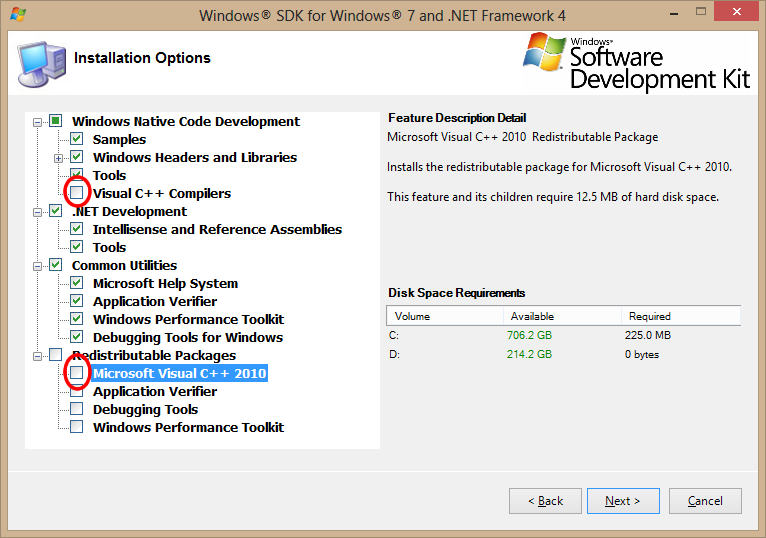 A problem occurred while installing selected Windows SDK components. Installation of the “Microsoft Windows SDK for Windows 7” product has reported the following error: Please refer to Samples\Setup\HTML\ConfigDetails.htm document for further information. Please attempt to resolve the problem and then start Windows SDK setup again. If you continue to have problems with this issue, please visit the SDKteam support page at http://go.microsoft.com/fwlink/?LinkId=130245. Click the View Log button to review the installation log. Before installing you need to remove all C++ 2010 components. Note that this issue is not unique to Windows 8, also affects Windows 7 and probably Windows XP too, though not tried it there.